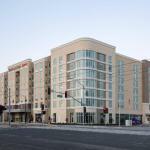 Guests are treated to free breakfast and free Wi-Fi when staying in the apartment-style rooms with full kitchens at the non-smoking Residence Inn by Marriott San Jose Airport. Seven floors boast 176 rooms at the non-smoking Residence Inn. Guests connect via free Wi-Fi and watch 48-inch flat-panel TVs and the modern rooms make extended stays comfortable with fully equipped kitchens and iPod docks. The daily breakfast buffet is included in the rates and guests can stay focused using the business center and gym. Unwind at the outdoor pool or serve up dinner al fresco at the outdoor picnic area. Other pluses include a 24-hour front desk laundry facilities and available parking as well as a free airport shuttle and free local calls. Pets are welcome for an extra fee. About a mile from the intersection of Highway 101 and I-880 the Residence Inn is less than four miles from central San Jose and San Jose State University. Also in town are the Municipal Rose Garden the Cathedral Basilica of St. Joseph and the Rosicrucian Egyptian Museum. San Francisco is less than an hour north and beaches along the Pacific are also about an hour away. Mineta San Jose International Airport is about a mile away and the Santa Clara Amtrak Station is four miles away.